The first picture reminds me a lot of Hamman Hall. The brick floor, the vertical aluminum things on the windows, and the the brick/concrete wall are all design elements in Hamman Hall. Though I don’t recognize that as any part of Hamman Hall. And I spent a lot of time there. I know this picture well. This is one of a group of pictures which was taken for the opening of the Shepherd School in 1975. The bearded gentleman is my and my wife’s bass teacher and mentor, Paul Ellison, who I believe is the longest serving Shepherd School faculty member. He’s still here. The student is David Malone, who is acting principal double bass of the Houston Symphony. He’s been a member of the Symphony for over thirty years. The bass studio in Hamman Hall was in the basement so it was common for Paul to have lessons in the stair landing near the men’s room, and that’s where this is. It was very, very much more resonant than the low-ceilinged studio. 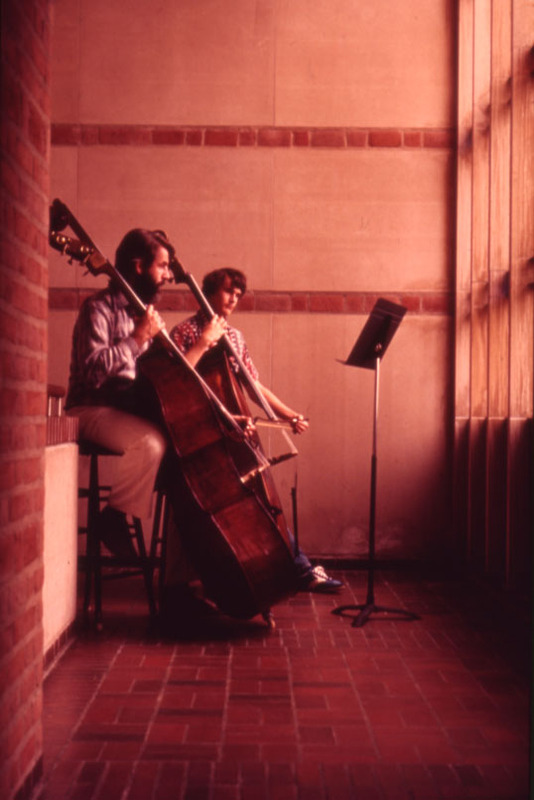 In 1975 I came to Rice to have a bass lesson with Paul (I was in junior high at the time) and I missed one of those steps going down to the basement carrying my bass. That was very nearly the end of my nascent musical career, but fortunately no instruments or musicians were harmed. If this is the way down to the basement, then I think the photo is reversed? If so, the photo is taken from the top of the basement steps (on the Mudd side of Hamman) facing the front inner wall of Hamman, then the windows ought to be on the left and the railing on the right. That would be why I didn’t recognize it. Doh! Of course the photo is reversed; their hands are backwards. And I, as a bass player, should’ve caught that because I’ve seen this picture many times. (And had lessons in that stairwell.) Good catch, Mike! I’m going to have to go take a look at this when I’m back on campus. I can’t call it to mind at all. 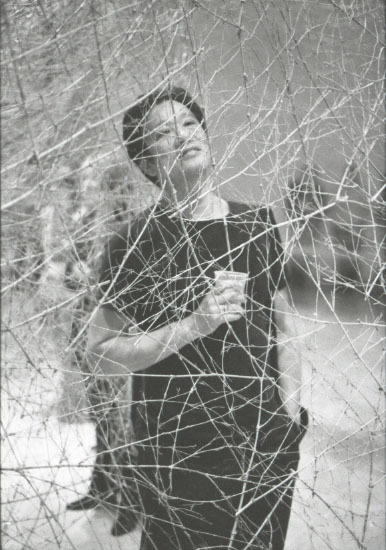 Could the art gallery photo be of Liga Pang’s Ikasu installation at the Rice Gallery (Nov 9 – Dec 9, 2001)? (http://www.ricegallery.org/new/exhibition/ikasu.html) ? Putin’s visit was on Nov. 14, 2001. Thanks, as always, Mike. I’d never seen that exhibition archive before. That’s the sort of thing that can come in really handy when trying to date things. Melissa, if you have been to events at Hamman Hall, you probably went upstairs, not down. Downstairs is just Rice Players offices and rehearsal rooms since the Shepherd School moved out in 1990. Rob and I met at Hamman Hall. We think it’s actually the lower lobby, tucked behind the stairs going up to the upper lobby. That’s the way David Malone still looks in my mind–he was a student at Sid Rich when Bill and I were masters there, 1976-81. He was already a superb bass player then.